Opening “Technology and Innovation Transfer” International Forum, organized by the Finance Ministry and Embassy of Germany to Ukraine, first Vice Prime Minister, Finance Minister underlined that Ukraine has to be guided by the experience of Asia but not Europe while choosing the strategy of development of Ukraine. “What is bad that China and India develop in four-five times faster? We also have to develop rather faster than Europe”, explained he his position. Finishing his speech with general phases about the importance of the forum and having listened to mister Shefers, Mykola Azarov went to the exit, where journalists waited for him. He said several words to representatives of mass media about the importance of the forum, after that he came to the topics, which were more interesting for him. First Vice Prime Minister said that the approval of the new Tax Code is very important, he supported the increasing of the number of free trade zones, which “raised Chine and India”, and said that it is necessary to introduce the tax preferences to investors. According to his words, in the new Tax Code it is scheduled to provide the norm, according to which all costs, directed for the buying new technologies, will be free from income tax. “Many people say about me that it is so call “azarovshchina”. But it is really “azarovshchina”. And I do not refuse from such approaches, if it work for the benefit of the state”, Azarov commented his positions with proud . The word “azarovshchina” appeared during the news conference several times. 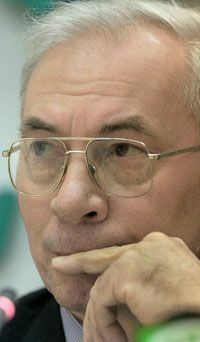 Every time Azarov marked with this notion the positions, which are principle for him, which have the positive character, for example, measures, which are taken in order to cope with inflation. When journalists asked Azarov to comment the high rates of inflation in this year, first Vice Prime Minister said that Ukrainian migrants, who came to work to west, are guilty in this negative tendency. “7 billion dollars came to Ukraine (from them), which the National Bank had to buy out and it means to issue new amounts of hryvna”, explained Azarov. Speaking about the international politics, deputy head of the government forecasted the signing the treaty on entrance of Ukraine to WTO till the end of the year. M. Azarov also said how Ukraine persuaded Kirghizia to give consent to signing with Ukraine the protocol on access to the goods and services market. “I gave the tasks to out delegation to agree with all trade conditions, which Kirghizia proposes to us. We have almost zero turnover, and Ukraine will win not very much and loose not very much, but there will be less arguments in Kirghizia”, said he. At the end of the news conference Mykola Azarov said to journalists that he hopes for the activization of the negotiations with Russia, Belarus and Kazakhstan about the start of the full-fledged work of the single economic space: “This is practically joint market, it is lucrative and interesting for us…I hope that we will resume these negotiations”.